We’ve all heard it … “breakfast is the most important meal of the day.” But are you eating the right things for breakfast to get your day started in the best way possible? 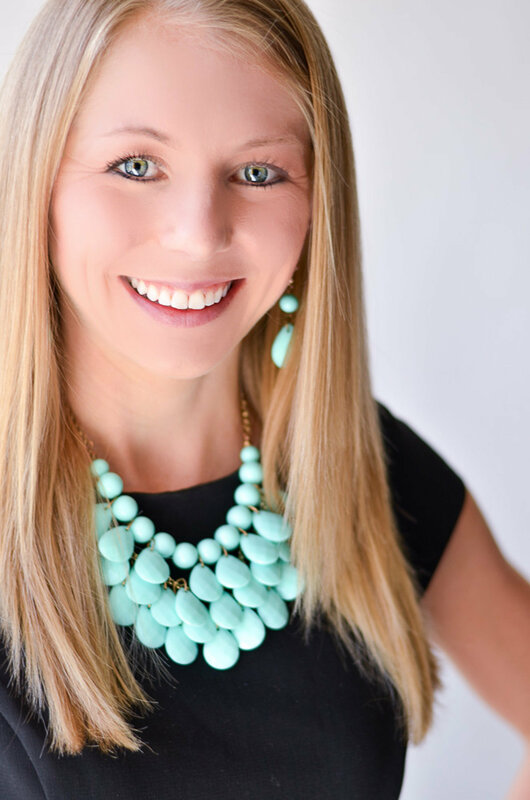 Read on to learn why I think breakfast is so important, and see one example of a common breakfast in my everyday routine. It’s true that eating breakfast gets your metabolism revving, helps to stabilize your blood sugar, and can reduce cravings for the rest of the day, as long as you’re getting a balanced, nutrient-dense meal. Research has shown that those who eat breakfast are better able to lose weight, maintain their weight loss, and have a leaner body composition than those who skip breakfast. Breakfast-eaters also exercise more regularly and eat fewer calories over the course of the day. 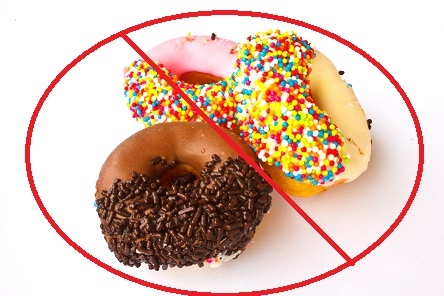 This great article cites that found that those who skip breakfast ate 40% more sweets, 55% more soft drinks, 45% fewer vegetables, and 30% less fruit over the course of the day. WOW! no bonus points for this one! Before you pat yourself on the back for that donut or sugared cereal, though, I think that getting a nutrient-dense, balanced breakfast is even more important than just starting your day off with anything. I look for a balance between carbohydrates, protein, and fat, because if I leave out any of those macronutrients, I’ll be hungry shortly thereafter (I’ll write another post on how I balance my macronutrients if you’re curious). Breakfast is the easiest meal to let added sugar sneak in, so I try to limit the added sugars as much as possible, and get my sugars mostly from fruit or the lactose in dairy. Here is one of my most common breakfasts – it fills me up, keeps me energized, gives me a great balance of nutrients, and tastes delicious! Even when I’m traveling, I try to stock up on the essentials at a local grocery store – this comes together in just a few minutes if you are prepared with ingredients! 1/4-1/2 cup plain canned pumpkin – Libby’s is by far the best brand in terms of taste, and is available at almost all grocery stores. Just be sure not to get pumpkin pie filling, which comes along with lots of extra sugar. The ingredients label should contain one thing only – pumpkin! It is delicious, and provides a whopping amount of Vitamin A and other antioxidants. 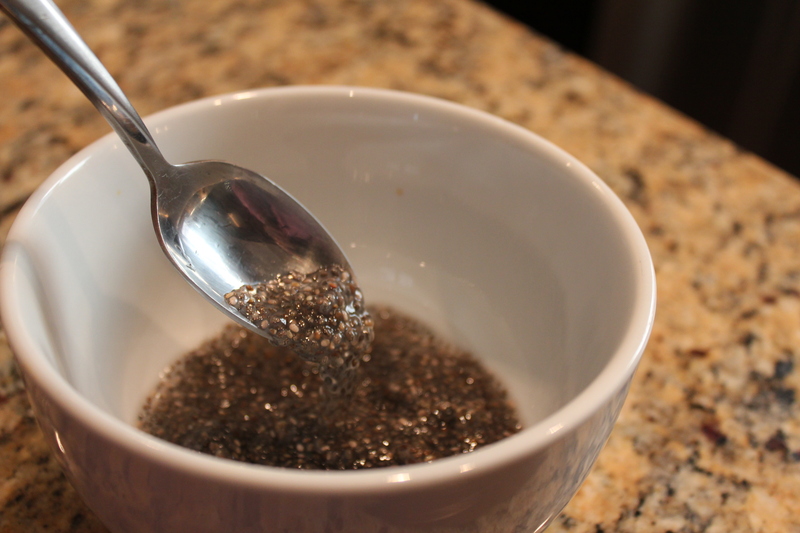 2 teaspoons chia seeds – a fantastic source of omega-3s , which have also been shown to limit blood sugar spikes, increase weight loss, improve brain function, limit depression, improve exercise performance, and so much more! 1-2 tablespoons raw, organic oats – great source of fiber and energizing carbohydrates, and give the bowl a great chewiness! I also substitute with whole-grain, unsweetened cereals (right now I’m loving puffed millet!). Heavy-handed shake of cinnamon! I’ve gotten a request to do a post on the benefits spices (coming soon! ), but suffice it to say for now that I absolutely adore cinnamon and go through it like it’s going out of style. 2-4 drops of liquid stevia for sweetness, or a teaspoon of honey or maple syrup. Don’t go overboard here! Simple – mix everything besides the berries and almonds together, and let it sit for a few minutes to let the chia seeds and oats absorb some liquid. If you have time to let your chia seeds soak in a few tablespoons of water (for an hour or so, or even overnight), you get this awesome pudding-like texture that gives your bowl a bit more volume, then you can stir everything else in later. 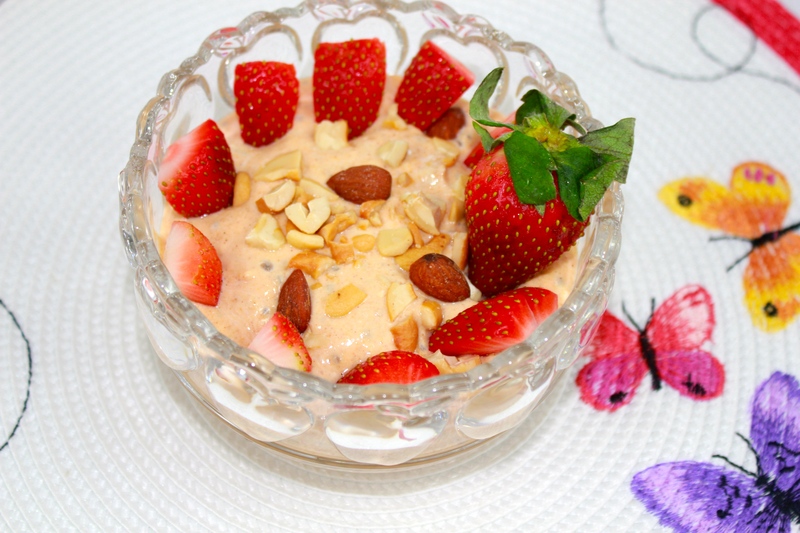 Once it’s all mixed up, top with fruit and nuts, and enjoy! You can make several variations on this same concept of yogurt + oats – just experiment and see what tastes good to you. 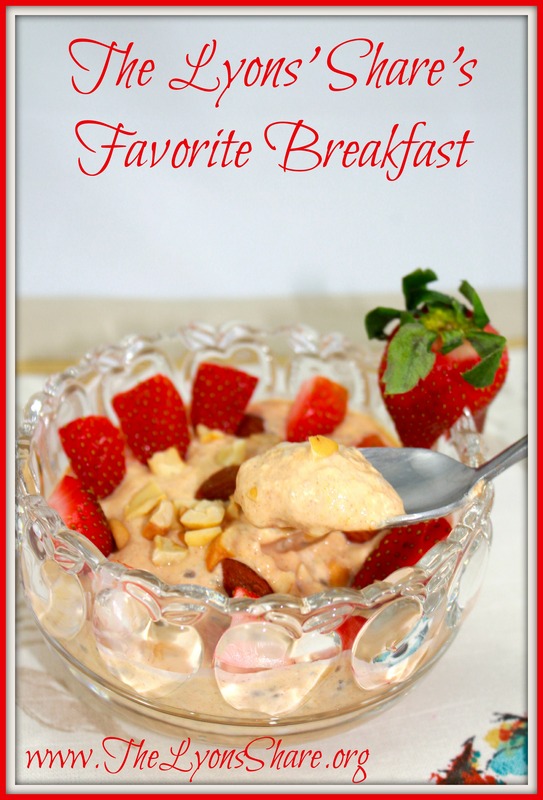 In fact, one of my favorite bloggers and real-life friends, Clare, just recently posted her twist on “overnight oats” on her blog! So tell me in the comments… what is your favorite healthy breakfast? 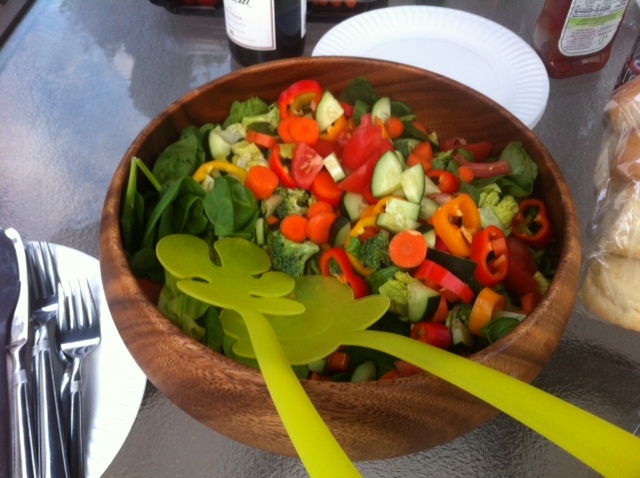 As a follow-up to yesterday’s salad post, I have to share 3 quick things … first, at a BBQ I attended last night for my sister-in-law and her fiancé, a beautiful, veggie-packed salad was served and enjoyed! I promised I would post a photo on the blog. Thank you, Emily! Second, although I don’t agree with all of the content the Hungry Girl posts, I got an email this morning with two of her salad swaps that looked delicious, so I thought I’d share!